Odisha DET 2019: Odisha DET is a state-level diploma entrance test and controlled by DTET, Odisha. It provides admission in various colleges of Orissa for diploma courses. Admission process of Odisha DET is organized by the Directorate of Technical Education & Training (DET), Odisha. The DET of the State looks after education at Technical Institutes/Colleges, Degree, Diploma and ITI level. The Department also promotes professional courses in Government and Private Sector. Students appearing /appeared for Odisha, DET can get admission to Diploma Engineering, Diploma Non-Engineering like Hotel Management, Hospitality management & Film Making studies etc. after 10th. We are mentioning schedule of Odisha DTE. Dates are not confirmed, it may change. We will update you with the actual date of the announcement of Odisha DET 2019 Exam schedule. You are suggested to visit the site regularly. Odisha DET application form will be available online. The DET authority will publish the application form of Odisha DET 2019 on their website www.dtetorissa.gov.in .Aspirants can visit the site and can fill the form. The application fee will differ according to the category. After completion of registration process. You will move to application form page. Fill the form correctly. Any wrong entry will discard your application form. The Odisha DET Application Fee for General/ OBC will be Rs. 250/- and for SC/ ST/ Female candidates, it will be Rs.200/-. Fee will be paid through online mode only. The Eligibility Criteria for Odisha DET 2019 is different for various courses. For 1st semester diploma in Engineering, the minimum age limit is 14 years. For Diploma in Film & TV courses, age must lie between 16 to 18 at the time of admission. The authority will decide the Odisha DET Eligibility Criteria according to the courses and will publish on the official website of Odisha DTE. It is mandatory to pass the 10/equivalent exam with Science and Mathematics. Check the course-wise eligibility criteria on the official website of Odisha DTE, Orissa. 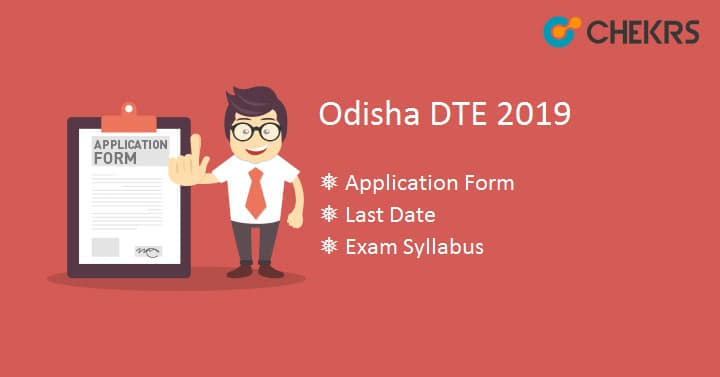 Odisha DTE is a state level entrance test for those candidates who want to pursue their career in diploma courses offered by the Directorate of Technical Education & Training, Odisha. Odisha DET Merit list will be declared by the authority on the website. The student who filled the application successfully can check their merit list of Odisha DET or Odisha DET 2019 Result. To check the merit list, enter the details like application number and date of birth and your result will appear on the screen. On the basis of rank or merit list, the applicant will get admission in diploma programs across various polytechnic colleges of Orissa.